Pros: Outstanding image quality — superb sharpness, detail and brightness. Up there with the very best optics on the market today. Good wide field of view, excellent edge sharpness and great low light performance. Optically there’s absolutely nothing to criticise here. Body feels bulletproof. Amazing padded strap has to be seen to be believed. 30 year warranty among the best in Europe. Cons: Just one…bulk. The MeoStar HD is a short, chunky binocular, and compared to some of its sleek contemporary rivals it does feel a little bulky and old fashioned. If you’re used to narrow barrels that offer an ergonomic “wrap around” grip the Meopta’s feel a little odd at first. Excellent strap was too long for me, even when adjusted to its shortest setting. Price: RRP c. €1,270 (GB£1,122). View the Meopta MeoStar 10×42 HD on the Meopta website. The Meopta distributor for the UK and Ireland is Avisum. Check their site for stockists or see the Amazon links below. 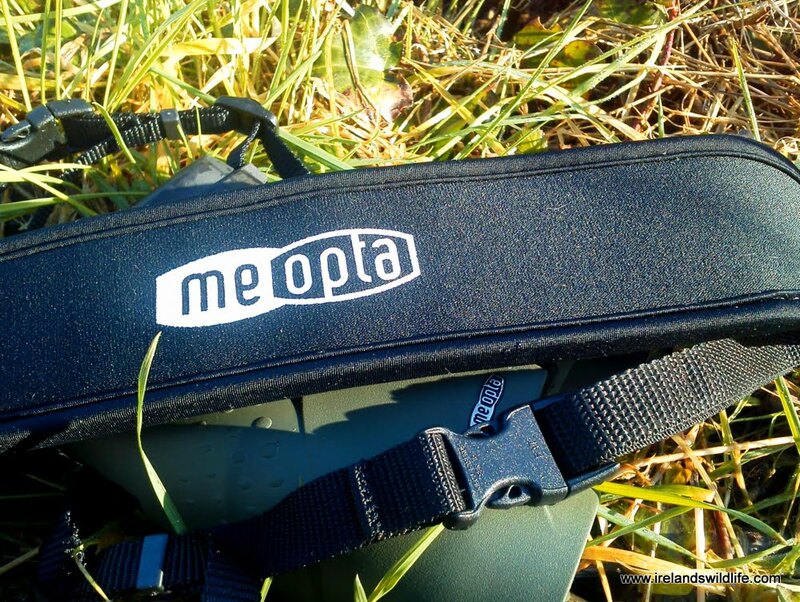 The Meopta MeoStar 10×42 HD binocular is without doubt one of the finest optical devices I’ve ever had the pleasure of using. Optically it is simply superb in every respect. The only thing that lets it down, for me at least, is its ergonomics. Compared to other high end roof prisms they are undeniably bulky, and although the balance is good, which compensates for the weight, they simply feel a bit too big in your hands. That said, you’d forgive the occasional ergonomic foible for this sort of optical quality. The view through the Meoptas is simply stunning. In terms of value for money it’s hard to fault them when you consider they are optically equal to glass that costs up to twice as much. If you’re looking at the best, then I’d recommend adding the Meopta MeoStar HD to your shortlist — try them side by side with the well known market leaders and see what you think. It’s not often that you’re rendered speechless when you look through a pair of binoculars… but when I first looked through the Meoptas they literally took my breath away. I’m used to using high end binoculars from some of the world’s leading manufacturers, and often the first step in assessing a new binocular is gauging just how far behind the big guns they fall. Not so with the Meoptas. To my astonishment the MeoStar 10×42 HD was the optical equal of pretty much any binoculars I’ve ever used from any manufacturer. Like the MeoStar S2 spotting scope I reviewed in late 2012, the 10×42 HD excelled in every optical department. I really couldn’t fault it. Meopta use superior quality components like fluoride glass and phase corrected dielectric roof prisms to deliver clear, sharp, high resolution views. All air to glass surfaces are fully multi coated with Meopta’s ion assisted MeoBright5501 anti-reflective coatings, minimising reflection and glare and enhancing transmission levels to an impressive 99.8% (claimed) for each glass surface. The binoculars also feature high-end features like tough, hydrophobic armour-coating on the external lens surfaces. These coatings protecting the lens surfaces from scratches and abrassion, improving usability in wet conditions and make the binoculars much easier to clean. All of this internal jiggery-pokery works to deliver a truly superb image across the wide field of view — which at 6.3° is very good for a 10×42 binocular… if not quite class leading. The quality of the view, the sharpness at the field edge and the relatively narrow black border all combine to immerse you in the scene you’re viewing. Like the very best binoculars on the market, the MeoStars don’t just bring the action closer… they make you feel part of it. Corour fidelity is excellent… and colours appear true, vibrant and natural. There’s excellent contrast and picking out subtle detail and plumage variation in challenging conditions is no problem at all. Low light performance is top notch too… matching the best and delivering a brighter image than some high spec 8×42 binoculars I compared them against. Glare, reflection, chromatic aberration and other difficult lighting conditions are all handled superbly by the optical system, and Meoptas meet or exceed the performance of other high-spec binoculars on all counts. 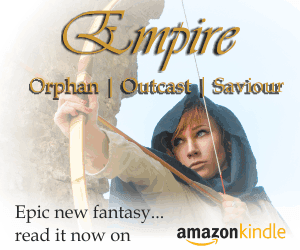 All in all the Meoptas deliver in spades on every level optically. Absolutely top marks to the Czech manufacturer in this department. Meopta used to manufacture optics for the Czech Military (perhaps they still do) and the MeoStar 10×42 HD certainly hints at that military heritage. They are a solid piece of equipment and feel like you couldn’t break them if you tried to (I didn’t, but they certainly feel as if they’d outlast me). The build quality is superb, the finish is excellent and every moving part works flawlessly. The MeoStars are shorter than most contemporary 42mm roof prisms I’ve used, and noticeably wider — possibly due to additional rubber armourthat provides a high level of cushioning and grip when holding them up, but lending them a chunky, squat appearance that to me feels a little old fashioned. Meopta has shirked the popular dual-hinge open-bridge design and the more modern single-bridge design that allows you to wrap your fingers around the barrel, in favour of a large central hinge. It makes the binocular feel like one solid unit, rather than two attached units, if that makes sense. It’s an incredibly strong design, no doubt, and works really well in the smaller MeoStar 32mm binoculars — but the extra bulk of the 42 mm for me pushes it beyond the threshold of comfort. The barrels simply feel too “fat” in your hand… for want of a better word… particularly if you’re used to the wrap around grip of contemporary high-end optics. 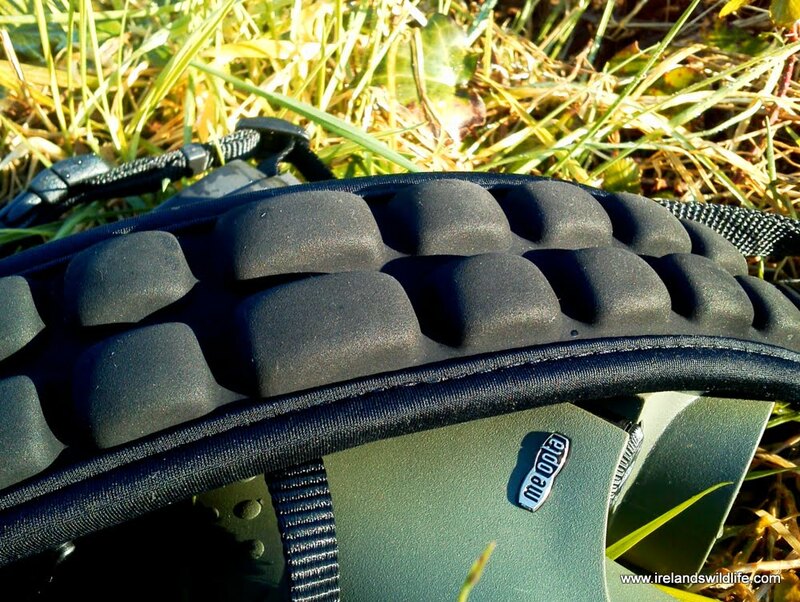 They’re not really uncomfortable to use… they’re very well balanced, and despite their weight are actually very easy to hold and use for long periods without excessive fatigue. They just feel a bit odd. You do get used to them over time, but I have to say I prefer the single-hinge design with the lower barrels exposed — like you find on the Swarovski SLC HD, the Nikon EDG or the Vortex Razor HD, for example. Twist up eye cups work well, and are easy to use… but I was surprised to find they had no intermediate stops between the fully up and fully down position. In practice though it was easy to set the eye cups in any position and they’d quite happily stay there until you decided to move them — so, practically infinite intermediate stops! An eye-relief rating of 15mm, while not huge, should be ample to allow most glasses wearers to enjoy the full expanse of the outstanding view the binocular delivers. The focus system is a dual wheel that sits in the usual place between the barrels. The larger inner wheel controls the focus mechanism, the smaller outer wheel controls the dioptre adjustment. The larger wheel is broad and wide enough to give excellent grip and is easily accessible with your fingers when holding the binoculars. It turns smoothly and easily through one-and-a-half clockwise turns from a close focus of 2.6 metres to infinity. Focusing is fast, easy and precise and I never had an issue trying to achieve a pin-sharp, clearly focused image. At 2.6 metres (8.5 feet) the close focus is a little on the long side for contemporary high end binoculars… which typically focus at around the 2 metre mark. In practice though there are very few situations in which you’ll find yourself needing to focus closer than eight and a half feet, so it shouldn’t really be an issue. The dioptre adjustment sits in front of the focus knob, and is a simple click-stop twist and adjust mechanism. There is no dioptre lock, and I was a little concerned that it’s position on the focus knob would lead to accidental adjustment in use. I needn’t have worried — it was never an issue during the extended review period. First things first — the strap that comes with the Meoptas is unlike anything you will have seen before — it’s thick padded neoprene about three inches wide, and the underside is studded with an array of cushioned air pockets that both serve as padding and provide airflow around your neck under the strap. 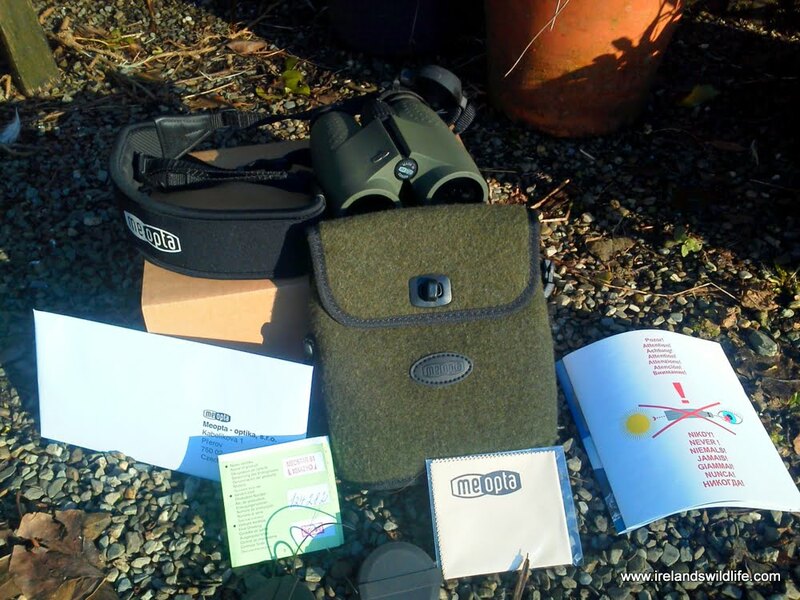 It’s ingenious… and incredibly comfortable, and compensates well for the weight of the binoculars. Quick release buckles on the strap are also a nice touch — and the strap doubles as a comfortable padded carry strap for the very distinctive padded green woolen case provided with the binoculars. The down side is that for me the strap couldn’t be adjusted short enough. I ended up with the binoculars dangling perilously close to my midrift, when I prefer to carry them higher on my chest. It’s a relatively minor complaint, but one that can niggle during a long day in the field. Tethered objective lens caps attach via the tripod mount and are easily removed if you don’t want to use them. The rainguard for the eyepieces is well designed, and has an clever ridge system that hooks onto the lip of the eyepieces. This secures the rain guard so it never gets dislodged when you’re walking about — even if you hold your binoculars upside down and shake them. When you want to look at something a simple flick of the leading edge of the rainguard releases the ridges and it falls away instantly. It’s an excellent system. The lens cloth provided is high quality and branded with the Meopta logo — what more can you say? In Europe Meopta offers a 30 year transferable warranty covering materials and workmanship. That’s a significantly longer warranty period than that currently offered by the leading manufacturers. The Meopta Meostar 10×42 HD is a very accomplished binocular from a pedigree European optics manufacturer that delivers real alpha class performance at a very competitive price point. It comes with an excellent warranty to boot. On paper it is a very compelling package, with a range of top-end features that rivals anything out there — and that perception only gets heightened when you actually look through it. I really is a very impressive binocular. My one concern is a personal one with the general ergonomics of the unit. I just didn’t feel the MeoStar was as comfortable to use as the wrap-around grip favoured by most contemporary high-end binoculars today. At first it felt very strange. As I used it more I got more comfortable with it, but it never quite reached that level where the binocular disappears into the background and I could use it seamlessly, without even noticing it. If Meopta took the MeoStar HD optics, and put them into a redesigned contemporary chassis with a wrap-around grip… then they’d have a real top contender. As it is the Meopta can match the best out there optically, and more than deserves a place on anybody’s binocular shortlist. 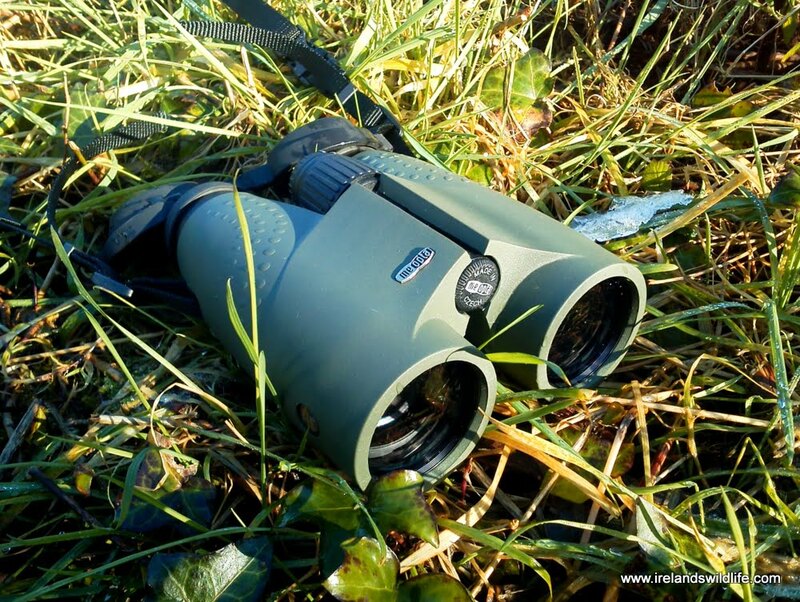 I’d like to thank the team at Meopta Sports Optics in the Czech Republic for submitting the MeoStar 10×42 HD for review on the Ireland’s Wildlife website.